Return on Equity (ROE) is a measure of a company’s annual return (net incomeNet IncomeNet Income is a key line item, not only in the income statement, but in all three core financial statements. While it is arrived at through the income statement, the net profit is also used in both the balance sheet and the cash flow statement.) divided by the value of its total shareholders’ equityStockholders EquityStockholders Equity (also known as Shareholders Equity) is an account on a company's balance sheet that consists of share capital plus retained earnings. It also represents the residual value of assets minus liabilities. By rearranging the original accounting equation, we get Stockholders Equity = Assets – Liabilities (i.e. 12%). Alternatively, ROE can also be derived by dividing the firm’s dividend growth rate by its earnings retention rate (or, 1 – dividend payout ratio). 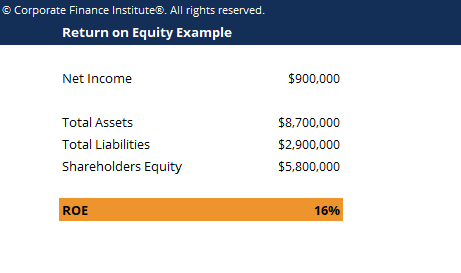 Return on Equity is a two-part ratio that brings together the income statement and the balance sheetBalance SheetThe balance sheet is one of the three fundamental financial statements. These statements are key to both financial modeling and accounting. The balance sheet displays the company’s total assets, and how these assets are financed, through either debt or equity. Assets = Liabilities + Equity as the net income or profit is compared to the shareholders’ equity. The number represents the total return on equity capital and shows the firm’s ability to turn assets into profits. To put it another way, it measures the profits made for each dollar from shareholders’ equity. A sustainable and increasing ROE over time can mean a company is good at generating shareholder returns because it knows how to reinvest its earnings in productive and high-quality assets. In contrast, a declining ROE means that management is making poor decisions on investing capital in unproductive assets.